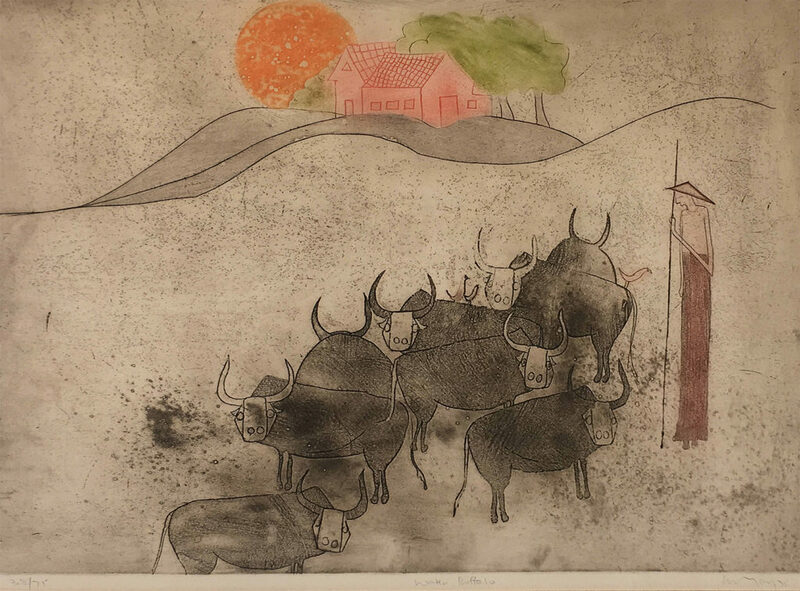 ‘Water Buffalo’, 1975 differs significantly from Eng Tay’s usual trademark paintings. Perhaps this painting was one of his early works, before discovering his niche. His works seem to possess an ability to draw its viewers in and that quality is palpable here. Eng Tay brings a universal quality, combined with personal myth into his works, and has evolved a narrative style that is lyrical, nostalgic, mysterious and exotic. He has found a way to reveal the harmony of life through the images of his memory. Since his goal is to create simple poetry, his are not ornate or pretentious but a poetic language that is freely accessible and readily learned, leaving a lasting impression of people in action and poetry in motion.